ZenduIT is excited to announce the new Geotab Drive integration with TruckMate. ZenduIT has partnered up with both Geotab and TMW Systems in order to provide a complete, easy-to-use solution. TruckMate is a robust comprehensive trucking industry oriented solution to manage billing, dispatching, maintenance, asset management, driver recruitment, and your company’s information in one central system. It can be integrated and streamlined to work with other business systems using an open software development kit. Why Integrate TruckMate with Geotab Drive? ZenduIT is focussed on making a fleet manager’s life easier, by integrating and combining different existing solutions as well as creating new solutions, to fit your specific needs. There are other TruckMate integrations on the market but unfortunately multiple capabilities were lacking or missing completely – this lead to the development of the Geotab Drive and TruckMate integration. Geotab Drive an easy to install and use Driver App that allows companies to manage their Driver HOS, DVIR, Messaging, and communication to custom apps like Truckmate Forms in a single app. 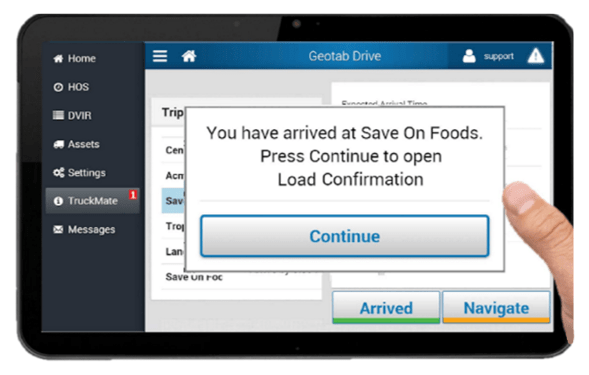 The Geotab Drive and TruckMate integration allows for auto-sync arrival notifications when a vehicle arrives at a customer zone, while other systems require the drivers to update the forms manually. The integration also allows for an automated “interview” with the driver on arrival and a map view of your fleet with relevant status information. It is made up of easy to use self-manage tools like device and driver mapping, and rule triggers; the total hours available are based on HOS. At ZenduIT it is our goal to streamline processes for fleet and field service companies. Ultimately, our goal is to make your job easier. We have experience building scalable mobile and web software that reaches across different platforms and device types for a variety of industries. Our main objective is to work with you to make your ideas into a reality. For over a decade, Geotab has been a proven industry leader in the area of fleet management and vehicle tracking technology, also known as telematics. Geotab’s advanced telematics is used to manage employee productivity and significantly reduce accidents. Geotab helps manage the maintenance, inventorying and fuel management of the company’s fleet vehicles. Geotab data is open and is easily integrated into your IT systems to automate. Many Fortune 500 companies rely on Geotab’s technology to provide measurable management data. With over 100,000 daily users of Geotab software that processes over 600 million data points daily, Geotab has established itself as a world leader in helping businesses move forward. TMW‘s solutions drive out inefficiencies and costs, improving profitability and visibility. We can help make the most of available capacity, bringing workflow automation and powerful business intelligence to the complex world of logistics operations and fleet management. Our more than 2,000 customers include thriving small, medium and large companies, enterprises involved with transportation or that operate as part of distinctive supply chain networks across North America and beyond.